Story and photos by Sarah Keller for the Intermountain West Joint Venture originally published in the Nevada Rancher magazine. As swallows flitted in front of 50 or so federal and state agency employees, scientists, ranchers and other partners seated on folding chairs, Rogers explained that one leg of the stool is the ranch’s economic viability – a financial objective. Ecological objectives make up the second leg, which includes reducing cheatgrass and promoting the perennial bunchgrasses preferred by both cattle and sage grouse, as well as reducing the size and intensity of fires. The third objective, perhaps the most important to Rogers, is the social aspects of the ranch’s existence. Social objectives mean maintaining and bettering the ranch’s relationship with the surrounding community. James Rogers, manager of the Winecup-Gamble Ranch, presents his unique approach the ranch's operation objectives. Then Rogers explained that there is a faulty component holding back the three core objectives in Winecup-Gamble’s operation – a functional grazing permit with the Bureau of Land Management (BLM). He’s hopeful that is changing. Winecup-Gamble’s BLM grazing permit is 30 years old. It’s become nearly impossible to operate the ranch’s overall grazing plan with rules written a generation ago. “If the BLM permit can in fact be written to be in alignment with the rest of our conservation plan, with the rest of our wildlife plan, with the rest of our economic plan, our social plan, and be written to cooperate with these other things, it becomes this entire ranch management plan that ties into the philosophy of what we’re doing,” he said. Even if it were up-to-date, the plan’s prescriptive nature is still a problem. It locks Rogers into certain cattle numbers, and the same grazing start and end dates for each allotment year after year. That’s despite changing land management needs due to fires, cheatgrass invasion, drought, and longer growing seasons that come with warmer temperatures. On the ranch’s private land, Rogers has innovated in response to those decades of shifts. But on the adjacent public lands, Winecup-Gamble’s BLM permit leaves little room for responding to even some of the most basic year-to-year changes. In some cases, the permit works against its intended goal of improving rangeland health. Tamzen Stringham and Lucas Phipps from the University of Nevada-Reno, and James Rogers inspect this site's forage availability. Trying to solve that permitting problem has placed Rogers at the forefront of a paradigm shift in the how the BLM oversees public lands grazing. Rather than trying to maintain or improve rangeland health by reducing cattle numbers or seasons of use, Rogers and many others think that grazing permits should focus on achieving certain rangeland conditions. Shifting emphasis to the end goal rather than focusing on prescriptive terms and conditions would give ranchers more flexibility to respond to constantly changing factors like weather, drought cycles, invasive species, and fires. In response to this need, the BLM created a new demonstration program called “outcome-based grazing” to provide a path for public land permittees to reach their goals for land stewardship and their livestock operations. In 2018 the BLM authorized 11 ranches in six states, including Winecup-Gamble, to test and demonstrate how outcome-based grazing permits could work. It’s an initial step in the lengthy process of rethinking how the agency permits public lands ranching. Back in the in Winecup-Gamble’s horse barn, those 50 or so resource professionals have been a driving force behind advancing outcome-based grazing at the national, state, and district levels. Together they form a collaborative group they’ve named Results Oriented Grazing for Ecological Resilience (ROGER), not to be confused with James Rogers’ last name. 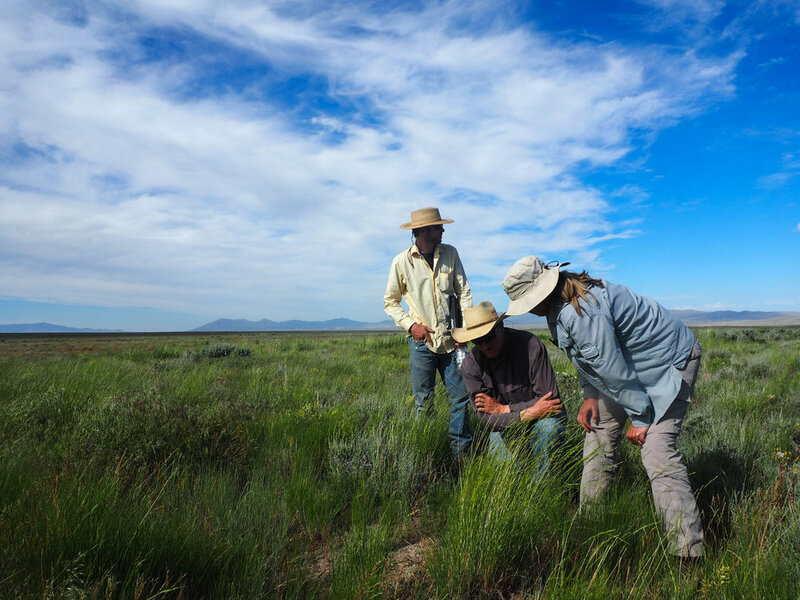 For the last two and a half years they’ve been working towards determining what healthy rangelands look like, what it will take to get there, and how to empower ranchers with permitting flexibility to improve and conserve rangeland. “ROGER has been great as a vehicle for taking some of these big questions and concerns about sage grouse, as well as grazing permits, that people have in the West, and elevating them to get some answers, instead of just continuing to fight about them,” said Laura Van Riper, a BLM social scientist who is coordinating the ROGER group. The ROGER group is working on answering some tough technical and practical questions about using newer remote sensing tools combined with traditional monitoring techniques to assess and monitor outcome-based grazing. A science sub-group of ROGER is working on developing and studying those monitoring tools, which should also help ranchers predict how a given management action will affect rangeland health and sage grouse habitats. The group includes ranchers, scientists from the University of Nevada, the U.S. Geological Survey, and consulting firms, plus representatives from the BLM, Nevada Department of Wildlife, and the U.S. Fish and Wildlife Service. The ROGER group hopes the BLM will choose to adopt those tools to monitor and adaptively manage outcome-based grazing, assuming the research project is successful. Healthy sagebrush stands with perennial bunch grasses make ideal sage grouse nesting habitat, as long as the cheatgrass is kept in check. As the ranch’s manager, Rogers offered Winecup-Gamble as a test site for the researchers. In addition to other research goals, Rogers hopes that the scientists will work with ranchers from the ground up to develop outcome-based grazing metrics that are relevant to how ranchers manage their operations. Labor-intensive studies of vegetation and soils are not well suited for monitoring an adaptive management system like outcome-based grazing. They are expensive for both ranchers and the BLM and impossible to repeat often enough or during the right time to measure all vegetation at a single site. Plus, the existing BLM monitoring system was designed to look at landscape-scale trends, not make decisions at the pasture or allotment scale that matters to a rancher. 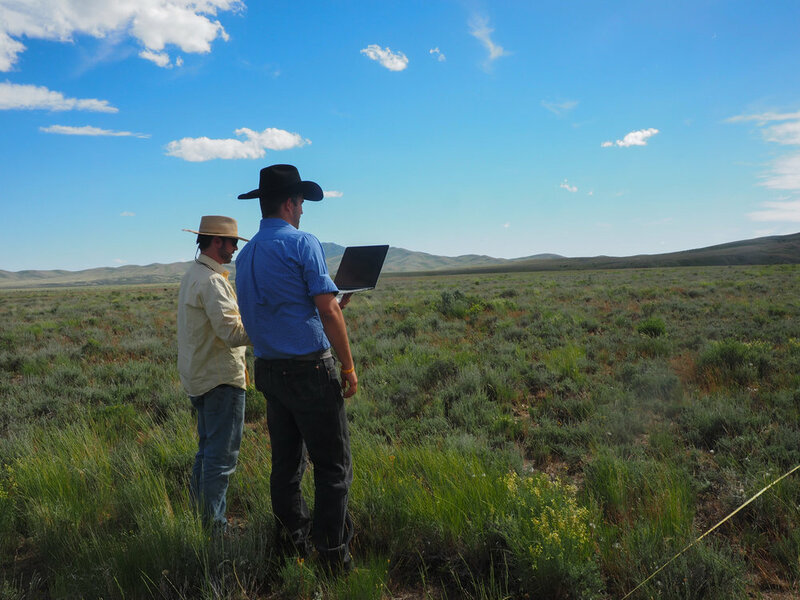 Since the BLM adopted its current monitoring techniques, remote sensing has emerged as a tool for getting a much more timely and comprehensive view of rangeland condition. The ROGER group plans to incorporate remote sensing into mapping and monitoring. The course, large-scale data it provides can show trends in sage grouse habitats over time, while finer scale data can help with planning and monitoring at the pasture or allotment scale. However, there are some kinks that need to be worked out – which is what the research project is hoping to do. Rogers has already embraced remotely sensed data for planning at Winecup-Gamble. Last winter, Open Range Consulting produced a remotely sensed map of the ranch at a scale of 30 meters. They are currently working on a 1-meter map. Walking around the ranch with the map on a laptop, Rogers developed a high level of confidence that the data lined up with what he was seeing on the ground. From a practical standpoint, this means Rogers can analyze a lot of things that he couldn’t before. He can get an overhead view of where to put firebreaks to protect wildlife habitats, or where to prioritize juniper removal for sage grouse. Because Winecup-Gamble has remotely collected data since 2009, he can even quantify change in the quality and composition of rangeland habitats over time. There is even older information, known as LANDSAT data that is also available to be brought into the picture and provide a 30-year landscape view over time. The ROGER science sub-group group is currently working out how they will use and study remotely sensed data for outcome-based grazing planning and monitoring. They are confronting challenges such as developing rangeland health indicators that remote sensing can detect, how to detect differences in specific vegetation types, and how to meaningfully integrate monitoring data at different scales. Lucas Phipps, University of Nevada-Reno, and Ethan Mower, Nevada Department of Agriculture, compare models for remote sensing for range monitoring with on the ground conditions. 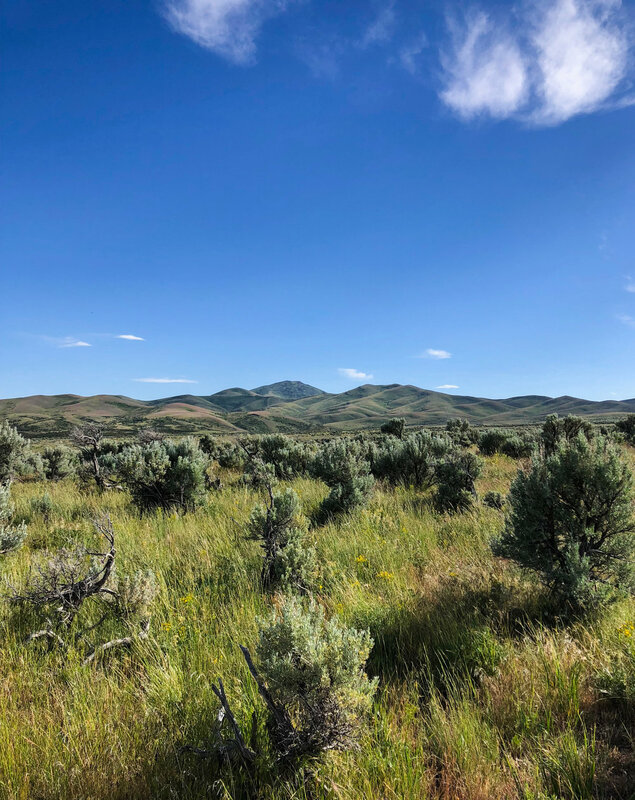 Upon arriving at an upland site on the tour, Tamzen Stringham, a rangeland ecologist from the University of Nevada-Reno, pointed out to the group that it consists of healthy sagebrush with perennial bunch grasses underneath -- prime sage grouse nesting habitat. But after the wet spring, cheatgrass was encroaching even more than usual. She warned that the cheatgrass, which emerges earlier and dries up sooner than perennial bunch grasses, puts that habitat at high risk for fire. This prediction came true just a few months after the tour when the Goose Creek Fire burned 132,000 acres, including a portion of the Winecup-Gamble’s public grazing allotment. Rogers noted that he could potentially mitigate cheatgrass in a lot of places with early season grazing. Cattle will help knock back cheatgrass if they can get to it when it is still green and before their preferred perennial bunch grasses emerge. But Winecup-Gamble’s current grazing permit doesn’t allow him to put out enough cattle, or early enough, to make a meaningful dent in the cheatgrass. Rogers remains optimistic that between the BLM’s outcome-based grazing pilot projects and the ROGER group’s work, there will be a future where he can use cattle to reduce risk to sage grouse habitats while also meeting the ranch’s social and economic goals. For now, he walks away from the still-green rangeland and reflects on his family’s public lands grazing legacy. Grazing policy frustrated his father, too. But Rogers is hopeful that the changes and partnerships underway will lead him to a different end point.